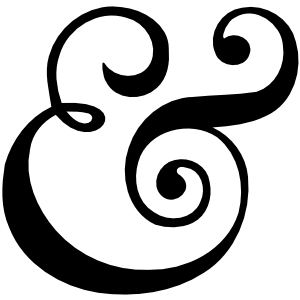 An ampersand I made in Inkscape. Mmmmmm. Type away & you’ll see what I mean. Superimposing subsets of analphabetic characters and symbols from one font onto another is an elegant technique to personalize or improve your typography. However, instead of simply replacing characters in the master font, wouldn’t it be more fun to locate and mutate the one font’s existing letterforms? In the following tutorial, I shall be showing you how to use Inkscape and some subsetting to make a stencil font using Arial Bold. Arial, as with all fonts created after the year 1989, is named for a character in the subaquatic Disney film, The Little Mermaid. Although Arial is the most notorious of post 1989 typefaces, Arista (dedicated to the mermaid protagonist’s sister) and Sebastián (which shares its name with the film’s dubiously Carribean decapod) are also worthy of note. These are all lies, of course. Ariel, the mermaid, isn’t even spelled “Arial”. 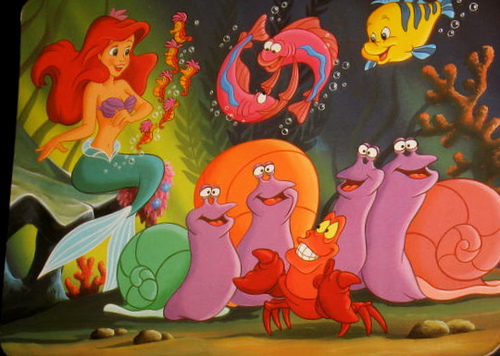 In reality, Arial was created by a team of ten designers headed by Robin Nicholas in 1982, some seven years before The Little Mermaid would reach cinema screens and an astonishing eighteen years before its sequel, The Little Mermaid 2: Back To The Sea, would find its way directly onto video cassette. Arial doesn’t really have a very colorful past and it’s not really a very colorful font. In fact, Nicholas himself is on record describing it as “a generic sans serif; almost a bland sans serif”. For our font hacking purposes, Arial is ideal. Firstly, its deliberately insipid letterforms make for a great blank canvas. Secondly, it is available pre-installed on most operating systems, meaning I can depend on most of you having it. Lastly, Arial itself — being based on Monotype Grotesque and infamously similar to Helvetica — is already something of a derivative typeface. This makes me feel a little less guilty about what we are about to do to it. Here’s a further demonstration. Try typing in the box using Arial Bold’s 4000+ character set. Most of the letterforms you see will belong to Arial Bold and are served from your hard disk. The others are the stencil characters we shall be manufacturing. I’VE NEVER HAD MUCH TIME FOR ARIAL. Note: The TTF to be created will be approximately 6.5K in size and will feature A, B, D, O, P, Q, R, a, b, d, e, g, o, p, q, 4, 6, 8, 9, 0, %, $, & and @ only. Note #2: Of course, not all devices will have Arial available. Your best bet is to put fonts similar to Arial lower down in the stack. Make no mistake: We are creating a new font to work with Arial Bold. While we are using Arial Bold to help us make new letterforms, we shall not be producing a “hacked” version of Arial that would be fit for distribution. 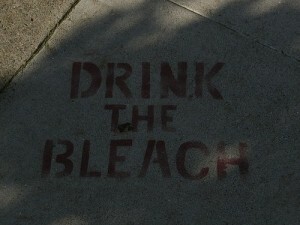 Our stencil “font” is not a true font because it simply doesn’t have enough characters to be used independently. That is, not even A to Z or a to z are covered. Meanwhile, Arial Bold itself — which supplies the remainder of the character set — is not embedded but loaded from the end user’s computer in the usual way. Windows users will no doubt recall they have a C:WindowsFonts folder. If pilfering our Arial Bold TTF were as simple as delving into this folder, I could have missed this step. It’s not. Thanks to permissions issues and a variety of other counterintuitive quirks regarding this folder, we’re better off doing a search for “arial”. On my Windows 7 machine, this unearths another folder with the memorable label of amd64_microsoft-windows-font-truetype-arial_31bf3856ad364e35_6.1.7601.17621_none_d09ba6bac4056b40, found in C:Windowswinsxs. Okay, then. Open this folder and duplicate arialbd.ttf into a location that’s within easy reach. I made a new folder called “Font Hacking” on my Desktop. Thanks to the W3C specification’s inclusion of SVG fonts, we can transform our TTF into an easily readable — and hackable — format. There are numerous options when it comes to converting between font formats. For the GUI agnostic, FontForge enables you to do these operations via the command line. If, like me, you simply can’t be bothered to install the massive package that is FontForge for a few simple tasks, there are online services like freefontconverter.com. I use this particular service frequently and have experienced no bugs to speak of. Upload your arialbd.ttf, choose “svg” from the dropdown, hit the massive, overdesigned “convert” button and save arialbd.svg in your working directory alongside the original. In order to change Arial’s letterforms as intended, we will need to convert the <glyph>‘s coordinate data into an editable Inkscape path. Fortunately, SVG’s supported <path> element also takes the d attribute. For our purposes, all but the id and d attributes are cruft, so get rid of them. Now your sandbox file is ready. To create our stencil font, we shall only be required to edit characters which have fully closed counters. These are A, B, D, O, P, Q, R, a, b, d, e, g, o, p, q, 4, 6, 8, 9, 0, %, $, & and @. 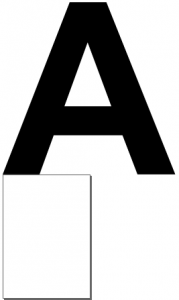 It would defy convention not to start with “A”, so return to your arialbd.svg and search the file for unicode="A". Copy the coordinate value from this glyph’s d attribute and use it to replace the equivalent d value in your sandbox file’s <path>. Step 5: Wait … what? 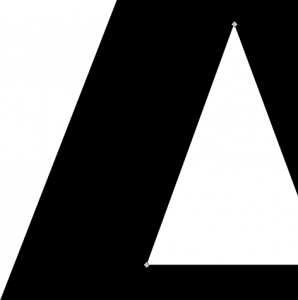 Upon reopening your sandbox document, you’ll see that famous Arial “A” and … it’s upside down. Oh. There is a reason for this and, according to at least one source, it is the ancient Periclean Greeks and their attitudes towards coordinate systems that are to blame. 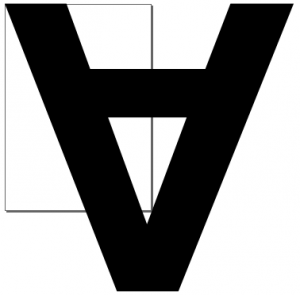 Finger pointing aside, the reality is that standard SVG vectors are drawn, like most image formats, from the top left, while SVG fonts are drawn from the bottom left. Note that the “A” now sits precisely on top of the canvas. Unnatural as it may at first seem, the top of our canvas can be safely treated as a guide for the baseline of our font. If we were to extend the letterform’s shape below this line, this portion of the letterform would indeed “hang down” much like the descender of a “g” or “y”. For our stencil font example, however, our path editing will be much more rudimentary. It would be entirely possible to emulate this aesthetic now that we have the letterform in our hand. However, I don’t want to get too bogged down in the finer points of Inkscape path editing. We’re going to keep it simple for now and just have the counters removed altogether. Select the “A” path by clicking on it and hit F2 to go into “edit path by nodes” mode. You should see some nodes marking the perimeter of the A’s counter (the hole in the middle). Select and delete each of these so that the counter is utterly eliminated. Save the sandbox file and reopen it in your text editor to refesh the path data. Now simply copy the value of the path’s d attribute back into the d attribute of the original glyph in your arialbd.svg file. Hit save. Arialbd.svg is now the full Arial Bold font with the “A” letterform curiously lacking a counter. Now that all of the letterforms you wanted to abuse have been abused, you’ll want to convert arialbd.svg back into a TTF file. Return to freefontconverter.com, upload the SVG and choose TTF from the available options. Hit the MONOLITHIC BLUE BUTTON and save the file as arialstencil.ttf. Those familiar with Font Squirrel’s superb webfont generator will already be comfortable turning this font into a kit. However, we’re going to want to base64 encode our font, which we shall be trimming down to a subset as proposed earlier. Remember: we’re not going to be using a hacked Arial Bold but a new font based on Arial Bold, with Arial Bold left intact. Font formats: Just have TrueType and EOT compressed checked. EOT is for Internet Explorer and will be served via URL, not base64 encoded. Finally, check the agreement and download your webfont kit. Nearly there. Your new kit will contain a stylesheet.css file and an EOT font. Wherever you use your stencil font, you’ll need to include the @font-face rules and place the EOT font file (for IE) relative to the stylesheet. As I have already stated, the “stencil font” example is relatively basic. It doesn’t really even change the letterforms’ shapes as such. More ambitious permutations you could try might involve breaching the baseline (as already discussed), or narrowing/extending the glyph width (being careful to adjust the horiz-adv-x attribute accordingly). It should be noted that, in my experiments, converting from SVG to TTF using online tools have resulted in a loss of kerning data. However, values for kerning can be found inscribed in Arial Bold’s many, many h-kern elements. sourcing and sequencing audio samples. I enjoy being able to turn mere consumables (adverts, songs, fonts, images) into my own cultural objects. I get a kick out of transforming diktat into dialogue, engaging with what’s already out there and forcing it to engage with me. If you share my inclinations, perhaps you’d care to outline your font hacking ideas in the comments. Alternatively, you can reach me on Twitter (@heydonworks). Even if your subversions don’t yield production-suitable typography, I hope you’ll gain a better appreciation of some of the most iconic and pervasive shapes known to the worlds of design and culture.